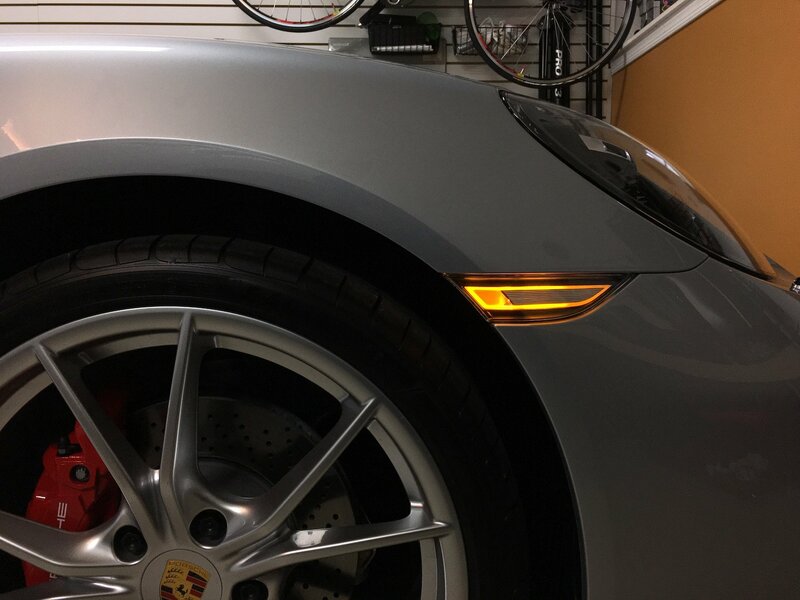 Porsche 718 Forum > Porsche 718+ Boxster And Cayman Ownership Lounge > What Did You Do To Your 718 Boxster/Cayman Today? > What Did You Do To Your Porsche 718 Boxster/Cayman Today? 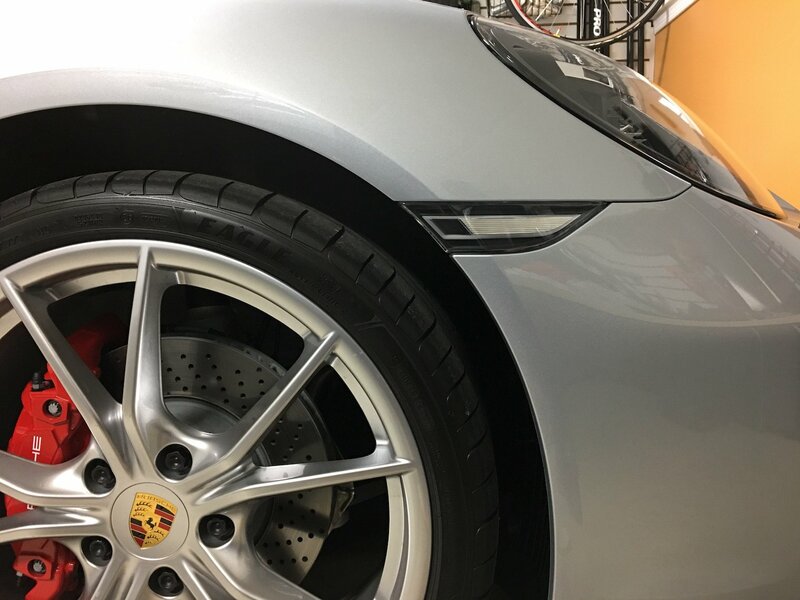 What Did You Do To Your Porsche 718 Boxster/Cayman Today? Share what you did to your 718 Boxster/Cayman with the community! Example: Installed the Tubi exhaust rear section, now looking for a tune. Installed a set of clear Side Marker Lights LEDs. Purchased from Suncoast. Installation is pretty much as described in the video on the Suncoast site, but I needed to use a flat blade screwdriver (wrapped in masking tape to protect the paint) to lightly pry the light away from the car. In the video, their light unit just seemed to spring away from the fender once it was pulled toward the rear of the car. That was not my experience. I for piece of mind, I looped a rubber band around the wire harness before disconnecting the light unit. I did this to prevent wire harness from falling back into the fender as the lead is very short. I'm pleased with the results. I think the look is understated and clean especially on my silver car. 718Admin, fjk737, bobskibo and 2 others like this. Last edited by agent 86; 12-30-2016 at 04:39 PM. I also installed a set of the Porsche all-weather mats. Only time will tell, but the Porsche mats are a whole lot nicer than the WeatherTech mats we have in our other car. The WeatherTech mats are about function. They perform the task, but are a challenge to clean and would be out of place in cars with "upscale" interiors, IMO. I have had my 718 Boxster since July. It replaced a 2014 981 and there is no comparison between the two. The 718 is superior in every way and now I enjoy the sound as much as the 981. The 981 didn't really sound good until above 5000 RPM. With the 718 because of its tremendous acceleration at low RPM's I very seldom reach 5000 RPM. Of course I do not track my car. When I bought the car I had the whole car coated with Flight Shield Sapphire V1 and then expel ultimate put on the whole front back to the doors, rocker panels and most edges. With the Sapphire V1 no more polishing and waxing the car. Just hose it off and dry with microfiber towel. I had the Smart Top engineer come from Las Vegas to San Diego and use my car as a test vehicle for the smart top for the 718. They had to make a few code modifications to the software, but it works perfectly. It sure is nice to put the top down as I am walking to the car and just step in instead of hunching down and fitting myself into the car. They have added a few new features to the smart top program. One I can remember is you can put the top up and down by touching the door handles in a certain way. It is also so nice that after I park the car I hit the top up button, shut off the engine and get out. Again I am out before the top it up which making exiting the car much easier for an old man. The one thing that I hated about the car was that every time you shut off the engine the sport mode and engine shutoff defaulted to the original position not where they were when you shut off the engine. I hated having to push both buttons every time I started the car. Of course I would forget and when I came to the first stop the engine would shut off. I hated that feature. Two weeks ago I received the Memory Module from T-design and installed it. Now both buttons stay in the same position they were when you shut off the car. No more engine shutting down when I stop. They have a very good video on how to install the module and it looks very easy. The only problem I had was taking off the trim around the console. You cannot just lift it up and it comes off easily. There are 10 clips and I had pry each one carefully open with a screwdriver. After I got it off, the rest was very easy. Enjoy your new 718 it is a whole new driving experience. Glad to hear that overall things are going good. I just hope you had a chance to take it out on some twisty roads since that's where it really shines and one of the ways to further appreciate it. Three weeks ago: Ceramic coating. How do you like the Ceramic coating? Where in PA are you located and would you recommend the place you got it done? You can PM me if you would rather. Also installed the clear corner markers; little effort to do so and I think it makes a big improvement on my GT silver car. I installed a set of Blackmill winglets, which do a fine job of eliminating any of the buffeting that occurs when windows are rolled down and the car is at speed. About to order a set of Exoticare floor mats - they really dress up the interior. So far, so good...stuff seems to slide right off. I had the work done by In Great Detail in West Chester. They definetly went out of their way to take care of me. Did you post photos of it anywhere here on the forums? I would love to see the "wet" look that it has and the sheen in the sun!